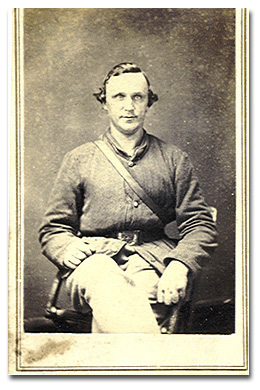 Corporal Alfred L. Sherer enlisted in Company "I", 4th Wisconsin Volunteer Cavalry on March 31, 1864 at Tomah, Monroe County, Wisconsin (credited to Shullsburgh, LaFayette County). He was recruited by Sergt D.A. Kenyon and enlisted for 3 years. He was mustered April 14, 1864 at Madison, Wisconsin. He was 28 years old, single, had blue eyes, brown hair, a light complexion, was 5' 10" and was a Carpenter. He was from Tomah, Wisconsin. He arrived as a "recruit from Depot" in May of 1864 at Baton Rouge, Louisiana. Sherer was transferred to Company "A" on August 23, 1865. He was promoted to Corporal in November of 1865. January and February of 1866 he was detached with the Post Commisary. From March of 1866 until his muster out in May he was detached as a clerk for Lt. Colonel Morse at Post Headquarters located at Ringold Banks, Texas. He was mustered out with his Company on May 28, 1866.